JD Restaurant – Responsive Joomla Restaurant Template Created by Joom_Dev. This templates have specific characteristics, namely: JD Restaurant Joomla Template is the ultra-responsive Joomla template specially developed for café and restaurant websites. So if you own a café, restaurant, food stall, coffee shop or anything related to foods and drinks, this Joomla restaurant template best fit for your website. It’s clean and . You can use this JD Restaurant – Responsive Joomla Restaurant Template on Cms themes category for acymailing, bootstrap, cafe, clean, helix, joomla, Joomla 3x, joomla template, K2, multipurpose, responsive, restaurant, Smart Slider, sp page builder and another uses. JD Restaurant Joomla Template is the ultra-responsive Joomla template specially developed for café and restaurant websites. So if you own a café, restaurant, food stall, coffee shop or anything related to foods and drinks, this Joomla restaurant template best fit for your website. It’s clean and fancy design add more value to restaurant website. 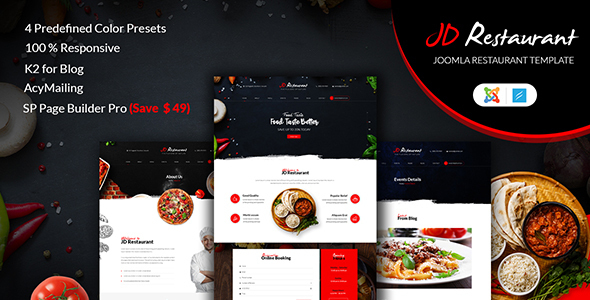 JD Restaurant is built with drag and drop SP page builder pro (You are saving $49) which makes it easy to create pages by just drag and drop elements. JD Restaurant comes with reservation system and other contact forms where a user can fill their information and make the reservation to celebrate their special day. This template is not only used for the making reservation, but it can also help you to organize events in your restaurants. It has pre built pages for the events.